Retail sales of construction and earthmoving equipment in the UK market grew by 1% in the third quarter of 2018, compared with the same period in 2017, according to the UK equipment statistics exchange*. 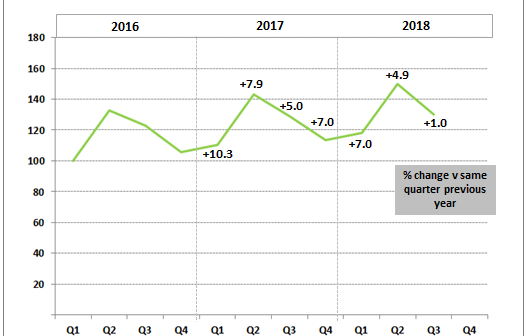 This continues the trend of a slowing rate of quarterly growth this year compared with 2017, with growth last year in Q3 at 5%. The graph below shows quarterly sales on an index basis, using Q1 2016 as 100. 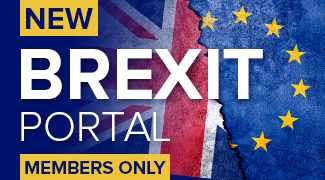 This illustrates a continuing upward trend in sales in the UK market, but at a slowing rate of growth. In the first three quarters of the year, equipment sales have recorded 4.2% growth in total compared with the same period in 2017, reaching over 24,000 units. The graph below illustrates a consistent seasonal pattern of sales across the last 3 years, with Q2 remaining as the peak quarter of demand. 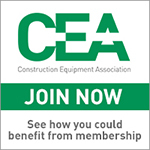 Overall, this is an encouraging position for the industry, against the background of a weak construction market, which is anticipated to show relatively flat output this year. Amongst the most popular machine types, crawler excavators (over 10 tonnes) showed the strongest growth in Q3, and as a result, are showing over 18% growth in sales in the first three quarters of the year. On a year to date basis, mini/midi excavators (below 10 tonnes) are the next strongest product, showing over 5% growth in the first three quarters of the year. 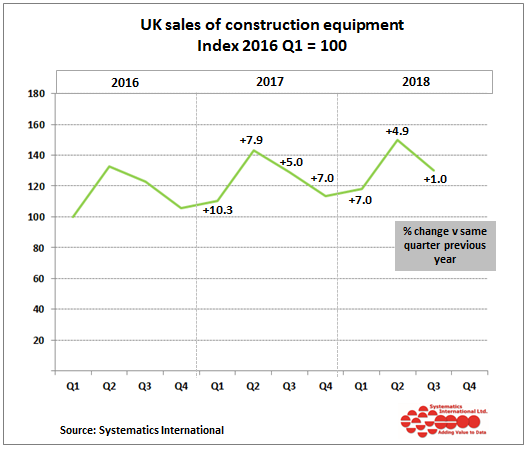 The equipment type showing weakest sales in Q3 was telehandlers (to the construction industry), and this has resulted in sales for the first three quarters of the year falling below last year’s levels. In contrast, sales of compaction rollers have continued to improve during the year, and on a year on year basis are now only 3% below last year’s levels in the first three quarters. *In 2017, the construction equipment statistics exchange was taken over by Systematics International Ltd., a specialist data processing company. 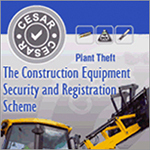 This scheme is run in partnership with the Construction Equipment Association (CEA), the UK trade association. Next Article GKD Technologies Marketing Specialist Graduates with flying colours!